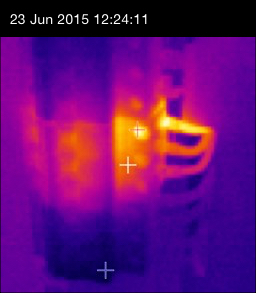 Infrared Electrical Inspection – So hot right now! There’s a lot of buzz around infrared, or thermographic, inspection right now, and for once the hype is justified. If you run a factory, shopping centre, commercial building or even a large office, an annual infrared electrical inspection can potentially save you a packet. 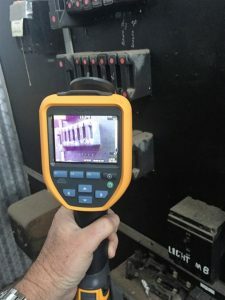 As one of Western Australia’s leading exponents of infrared electrical inspections, PRF Electrical’s Phil Fraser knows just how valuable it can be. Phil said that the thermal images that result from the inspections help experienced readers locate hotspots that in wiring, switches, isolators and other components. 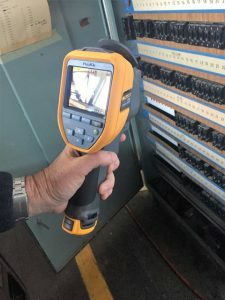 These hotspots can be caused by defects in connections or in the components themselves, but the important thing is that an infrared inspection can identify these issues before they fail. Increased heating or overheating is the telltale signature of imminent failure, and it identifies precisely where the failure will occur. That gives you the opportunity to replace faulty or otherwise exposed items before they breakdown, and potentially cause much greater damage. Prevent failures that can cascade through the system. Extend the serviceable life of equipment. No stoppages or interruption required for the inspection. Lower repair costs and simplified maintenance. You could even enjoy lower insurance premiums thanks to the reduced losses and ensured continuity of production that an infrared inspection can provide. Phil said that the PRF Electrical team is ready to take on infrared imaging inspections at short notice, and that his operators have the experience necessary to get the best results. ‘We’ve dealt with everything from factories to regional shopping centres, to office buildings,’ said Phil. ‘We know what we’re doing, and we’d be happy to show anyone who’s interested a sample report so they know what they’re getting into,’ he said. If you’re interested in discussing how an infrared imaging inspection could help your business, contact Phil Fraser.